Until 1929, the minimum ages people could marry were 12 for girls and 14 for boys. In 1929 both ages were raised to 16. The consent of parents was required for those under age 21. Apart from Jews and Quakers, most people had to get married in the parish church. Parishioners were usually married by Banns, which meant that details of the proposed marriage were announced from the pulpit (of both the groom AND bride's parish churches) for 3 consecutive Sundays prior to the marriage. At the same time a challenge was issued in the usual way: "If any man knows reason why these two should not be joined etc.....". 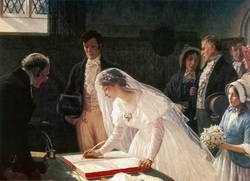 The delay and public aspect of Banns could be avoided by the purchase of a Marriage License (usually from the Archdeaconry Court). Maybe it was because they could afford to pay for a license. Before 1754 in England, when Lord Hardwicke's Act came into force [which stated a marriage was only legally valid if the banns had been called or a marriage license had been obtained], it was possible for eloping couples to be married clandestinely by an ordained clergyman, a favourite location was the Fleet Prison, a debtors' prison in London, in which clergymen willing to celebrate irregular marriages might be found.